It's always such a reward to hear such kind feedback and testimonials after completing some photography for someone - it makes it all SO worthwhile. Thanks to everyone for their kind thoughts - here is just a selection of the feedback received. There are more reviews on my Facebook page. Thank you so much for our wedding photos - they are beyond what we ever imagined! I actually can’t put into words how absolutely thrilled we are with the photographs you have taken for us. They are absolutely beautiful and we are so incredibly happy that you were with us to capture our truly magical day. We can’t thank you enough for your amazing work. I’ll have a look through and get back to you with the shots we choose. The photos are AMAZING!!! Absolutely love them! Thank you so much. Geoff has made an amazing job of our wedding photos. He listened and created exactly what we wanted and his friendly personality meant we were both at ease straight away. I am so glad we trusted Geoff with the most important memories from our special day. Thank you! Geoff photographed our wedding and from first meeting Geoff, we knew we wanted him to be our photographer, as he is very personable and easy to get on with. On the day, Geoff made us feel extremely comfortable in front of the camera. In addition to the formal wedding photos, Geoff is particularly good at capturing the informal photos from the day, which gives the album a really personal feel. The design of our album is really modern and innovative, and Geoff was very accommodating with our fairly specific amendments. The memories in a person’s life are the most precious thing you could have, so thank you for making ours so special! You have captured every moment of the day! Darren and I couldn’t thank you enough for all the hard work you put in on the day. Fantastic! Wow! What a fantastic set of images!! I’ve got to blame you for making me cry whilst I watched the slide show for the first time! I know I was really apprehensive about certain shots when we met, but I’m so glad you did them all! You captured some fantastic moments so seamlessly - just fantastic and we can’t wait to collect the usb and choose the ‘thank you card’ photos! I can’t tell you how delighted we are with the photos, they captured the day perfectly, in fact it looks like a photo shoot, the sky and the surroundings look amazing and I don’t think any of us realised how gorgeous Becca and Jonty are!! Including Becca and Jonty! You managed to capture the wedding and the preparations without being obtrusive, and I think that that the atmosphere is reflected in them. We had a lovely day, and your photos are a wonderful reminder. Thank you so much for the amazing job you did on our wedding photos – you truly managed to capture every last detail and we are absolutely over the moon with them!! You are now the official EAU/nurses’ photographer and it’s no wonder you keep getting bookings – you’re an absolute star! You’re very professional in what you do but also very relaxed in your approach & you really made me and James feel at ease from day one of meeting you! Also thank you for meeting with us at the venue before the big day – it really helped put us at ease & feel better about the whole day – and a massive thank you for the beautiful picture you gave us on our wedding day – it was such a lovely thought and so very kind of you. 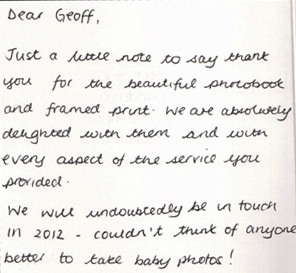 Geoff, you truly are a legend & we will keep on highly recommending you – thank you again for everything.